The weavery provides essentially therapeutic, but meaningful skilled work, for residents and co-workers. Residents learn to create and weave beautiful fabrics using a range of wools and cottons, in an array of colours and designs. The workshop is a space where everybody is given the opportunity to harness their creative side as each person is encouraged to make all of the creative decisions related to their work. We cover all aspects of textiles e.g. 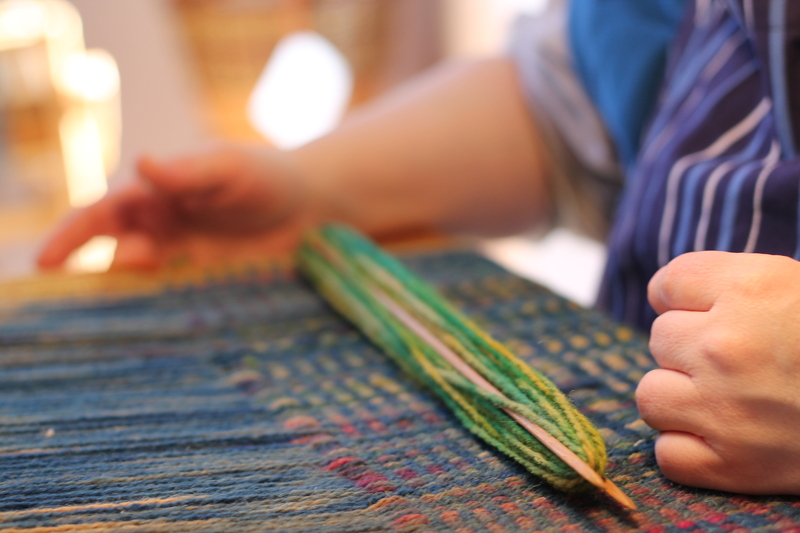 weaving, carding the wool, spinning, dyeing, weaving, hand finishing and stitching. We also do felting, embroidery, frame weaving, peg loom weaving, eco printing and painting. Each person also has the opportunity to take part in a QCF (Qualifications and Credit Framework Levels 1-3) in Creative Crafts in a number of different disciplines. Please look at http://www.rewardinglearning.org.uk/microsites/creative_crafts/ for more information in this qualification. We usually start with painting to choose our colours. Then we go and match our colours to our yarn, or dye the colour that we want. We then design the warp, dress the loom and choose our weft colours. Everything here in the weavery is handmade. Each person gets to choose what their final woven fabric is made into and is involved in the process - which means that each piece of work is unique and individual to each person; everything we make is truly original. We aim to use every scrap of textile and will recycle donated fabrics as lining, or we dye and print on them to give a new surge of life. This gives an added value to our handwoven work. We believe that creativity has no limits because imagination has no boundaries. Everyone has their own way of expressing themselves. Each person has a lot to say; it’s just finding ways to say it - which is our aim! We are currently working on the possibility to sell our products online - please keep checking our facebook page (facebook.com/CamphillClanabogan) and click on “Shop Now”. You are most welcome to come to our workshop during our work hours (Mo-Fri 9.30-12.30 and 14.30-17.30) to see our weavers at work and choose from the large variety of our products. Prices range from £2 for bookmarks or keyrings, £25 for cushions or aprons up to £200 for hand spun, hand dyed and hand woven Irish throws. Hi! I'm Philippa and I've been working here at the Weavery since 2014. When I first came, I had not long finished my degree in Textile Art Design and Fashion in which I specialised in hand weaving. Over the years, I have discovered the magic in enabling our artists to develop our products. My work fulfills me as it gives me the possibility to experiment further than the norm, to go for the less conventional and more creative path. My colleagues laugh at me as they find wound up textiles hidden somewhere in the community (like in the compost) for our eco printing experiment! Right now, I am training to become an art therapist. I am proud to say that I was accepted at the University Of Ulster and I am grateful that Clanabogan grants me the space I need to continue with my studies.